There's an old joke about San Francisco real estate, that land here is so expensive because they're not making any more of it. 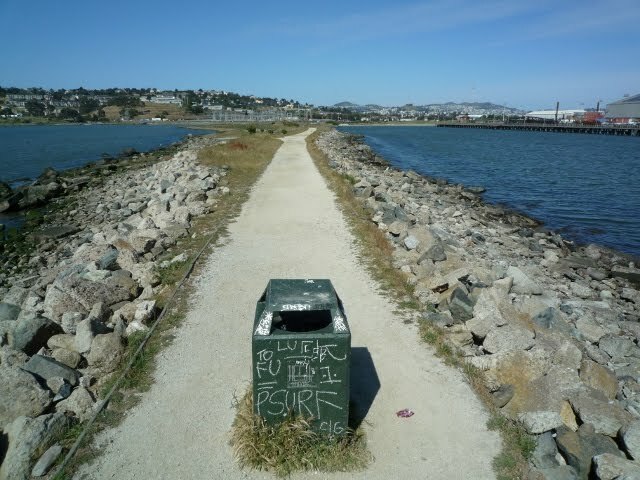 Our small city's shoreline has been altered by landfill and subsequent development in the past, but in more contemporary times the emphasis has been on coastal conservation rather than fill and build. What is now called Heron's Head Park is one of the last bits of artificially made city land. This small peninsula was born in the early 1970s, as part of a Port of San Francisco shipping terminal project that fizzled. The land remained, abandoned, until the late 1990s, when environmental groups cleaned up the site and opened it as Heron's Head Park. At first glance it's a strange location for bird watching -- Port of San Francisco cargo terminals loom directly to the north, and the old Hunter's Point Power plant (now being dismantled) wheezed just to the southwest. But this little scrappy spit of land is surrounded by water on three sides, with small patches of salt marsh protected on the south part of the park, and although this man-made habitat fails to resemble any of the other pristine natural bay area shorelines, it attracts a huge variety of waterfowl, shorebirds, and wading birds, as well as songbirds, owls, hummingbirds, and more. The trail runs less than a mile before it dead-ends at the bay, and the grade is perfectly flat, making this a great choice for a family walk with the very young or very old. It's also an exceptional choice for beginning birdwatchers -- bring binoculars and a field guide! Read more about Heron's Head on Bay Area Hiker.